Sometimes I wonder why people use the phrase “when pigs fly” when they try to convey that something is impossible. Shouldn’t they say something like “when humans fly,” since scientists could one day genetically modify pigs to give them wings? You know, since it’s less likely for these scientists to do their experiments on human beings. Or have they already succeeded in doing so? 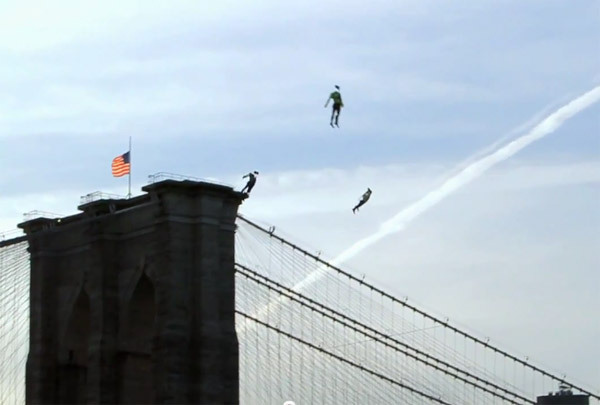 Pictures don’t lie, but you aren’t really seeing real people flying around New York City. And while I was hoping they might be real people with jetpacks, they’re actually remote-controlled planes built in the shape of human beings. The R/C humans were made to fly around various landmarks in the Big Apple, including the Statue of Liberty. They were thought up by the marketing people behind the upcoming movie, Chronicle. And even though I have never heard of the movie until now, this ploy makes me want to go see it.